The PDF of this report is now available, print size and mobile size. A leaflet advertising this report is available here. In 2014, China’s President Xi Jinping invited the United States to join the largest infrastructure project ever undertaken by mankind, China’s great Belt and Road Initiative, also known as the New Silk Road. President Obama refused, opting instead for military encirclement of China, and economic warfare through the exclusion of China from the Trans-Pacific Partnership trade deal, just as he had launched similar geopolitical attacks against Russia.1 The 2013–2014 coup in Ukraine, for which Obama’s State Department expended over $5 billion dollars and was caught literally dictating who should lead that country, was designed to isolate Russia militarily and economically. Obama’s policy, produced by the British and supported by the Western elites, was born from the fear that China’s Belt and Road Initiative—aimed at securing prosperity for the developing world, and providing modern infrastructure for all—threatened Anglo-American dominance of the world. This is a false and possibly fatal delusion, as presented by Helga Zepp LaRouche below. Following the defeat of Obama’s political heir, Hillary Clinton, President Donald Trump has sought to overthrow this geopolitical onslaught against Russia and China. He has pursued a better relationship with Vladimir Putin based on the common interest of fighting terrorism and developing the world, and he has developed a friendship with China’s President Xi Jinping. Domestically, President Trump has repeatedly referenced the critical economic framework needed to rebuild the United States: the American System of political economy, founded by Alexander Hamilton and carried forward in the physical economic development of our own country by Hamilton, Abraham Lincoln, and Franklin Roosevelt. If you are searching for the reason behind the crazed and insane attacks on the President, look no further than to these three things. Every resource known to Wall Street, our Hollywood culture, our Washington D.C. intelligence community mandarins, and our contrived news media has been leveled at attempting to drive President Trump away from mutually beneficial relations with Russia and China, and a revival of the American System of economy. 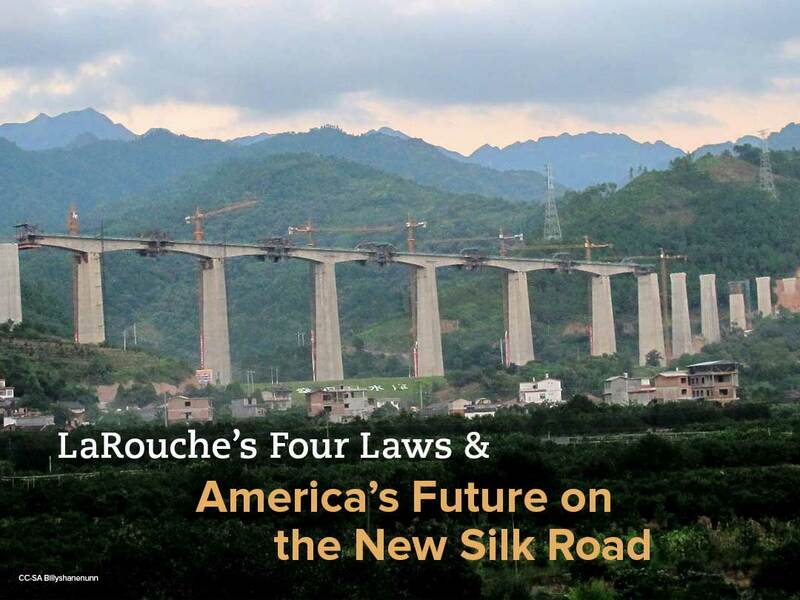 In this pamphlet, we introduce you to China’s great Belt and Road Initiative and lay out, in that context, Lyndon LaRouche’s Four Laws for Economic Recovery of the United States. What might seem like two distinct ideas are, in fact, one. Lyndon LaRouche and his wife Helga Zepp-LaRouche have campaigned for more than 40 years to develop the world, promoting scientific breakthroughs, grand designs for economic development, and a renaissance of classical culture. LaRouche has used his groundbreaking discoveries in economics to fundamentally advance the American System of political economy, as proposed and practiced by Hamilton, Lincoln, and Roosevelt. This is the program encompassed in LaRouche’s Four Laws for Economic Recovery of the United States. Helga Zepp-LaRouche’s decades-long campaign in China and other nations for a New Silk Road of modern infrastructure development and a revival of classical cultures, both East and West, has earned her the name “the New Silk Road Lady” in China. The Belt and Road initiative reflects the vision of both Lyndon and Helga LaRouche and encompasses the fundamental economic ideas animating the American System, ideas which have been largely abandoned in the United States. There is no better guide to China’s grand project, and the historical significance of the United States itself adopting a new paradigm of economics and international relations, than Helga Zepp-LaRouche herself. And, so, we will introduce this pamphlet through a speech she recently gave at a Schiller Institute Conference “Fulfilling the Dream of Mankind” held in Bad Soden, Germany on November 25, 2017. We have edited her remarks for purposes of space in this pamphlet, but encourage you to view the video in full. Read this speech with the sense of adventure, optimism, and big thinking which accompanies acts of discovery, rather than the small-minded pessimism which we are fed daily in our country. Helga's keynote address to the November 25-26, 2017 International Schiller conference in Bad Soden, Germany. Helga Zepp-LaRouche: Let me begin with an idea developed by Gottfried Wilhelm Leibniz. He said that we are actually living in the best of all possible worlds. This is a very fundamental ontological conception. It is the idea that we are living in a developing universe, that what makes the universe the best of all those possible is its tremendous potential for development. And it is created in such a way, that every great evil challenges an even greater good to come into being. I think when we are talking about the New Silk Road and the tremendous changes which have occurred in the world, especially in the last four years, it is actually exactly that principle which is working. Because it was the absolute, manifest lack of development under the old world order, which caused the impulse of China and the spirit of the New Silk Road to catch on, so that now many nations of the world are absolutely determined to have development to give a better life to all of their people. Now, I think that the New Silk Road is a typical example of an idea whose time has come; and once an idea becomes a material reality in that way, it becomes a physical force in the universe. I personally have had the chance to see the evolution of this idea, which in many senses really started with this great gentleman—my husband, Lyndon LaRouche, who many decades ago—almost half a century ago—had the idea of a just new world economic order. This then became more manifest in the 1970s, then in the 1980s, but especially in 1991, when the Soviet Union disintegrated and this idea of creating a just new world economic order became very prominent. I personally had the chance to see how it spread, after President Xi Jinping announced the New Silk Road in 2013 in Kazakhstan. I visited China in 2014, and at that point there were still only a very few officials discussing it. But then it spread very rapidly. There were industrial fairs in all the cities of China; there were hundreds of international symposia; the BRICS countries started to join in the same spirit, as did the Shanghai Cooperation Organization (SCO); altogether, more than 100 large nations and international organizations joined in support. This was evident in the Belt and Road Forum this past May, where twenty-nine heads of state spoke and 110 nations participated. Then I think the determination of the Chinese people to effect a new world economic order was consolidated in a completely new way at the 19th Congress of the Communist Party of China in October. Now the Chinese media announce very proudly that this is a grand vision for the future. A new era has dawned. Xinhua wrote that “China will make a new and greater contribution to the noble cause of peace and development for all of humanity.” Well, it is very easy for the Chinese people to understand that, because the whole country is already united around this mission. The spirit of the New Silk Road has also caught on in the 70-plus countries that are cooperating. There are many people in the West who have also understood that, either because they have investments in China, or because they know that the New Silk Road is the largest infrastructure program in history. It is already now twelve or maybe even twenty times larger than the Marshall Plan was in the postwar period, but without its military connotation. It is creating total enthusiasm among all those who understand this project. Der Spiegel magazine of last week had a big cover story with Chinese on the cover—“Xǐng lái!” which means “Wake Up!”— and an article about the awakening giant, writing that when Trump went to China just two weeks ago, he kowtowed; that this was his farewell speech, handing over the leadership of the world! That the West must urgently wake up and unite against a rising China, that the Chinese achievements are a threat to the values and the system of the West. Now, isn’t this funny? One day the headlines say that the collapse of the Chinese banks and the Chinese economy will trigger a world financial collapse—but the next day, the same papers write that China is about to take over the world. Obviously, some of these critics are completely freaked out about the fact that the old order is very clearly not working—the idea that you can have a unipolar world and geopolitical control based on the Anglo-American special relationship in the tradition of Churchill and Truman in the postwar period, and what the neo-cons started to build after the collapse of the Soviet Union. So, there is no comprehension among these parties of the rapidly changing strategic alignment going on in the world. The common denominator of all of these phenomena is that the Western, neo-liberal, left-liberal establishment is completely unable, and unwilling, to reflect on the causes of the demise of this Western system, which are: The absolutely ridiculous income gap, where eight individuals have as much wealth as half of the rest of humanity, while the gap between rich and poor is increasing in every country; the policy of regime change, of color revolution; and the abysmal situation of the refugee crisis. Also, people have seen that what we have been fighting for, for literally centuries, in terms of civil rights, has almost vanished without discussion. There is total surveillance by the NSA and the GCHQ—the British secret service. Western values of democracy are in shambles. If the Democratic Party leadership decides one year before the party convention who the candidate will be, and then manipulates the election against Bernie Sanders for a year—that is not a happy picture of democracy. There is the collusion of the Democratic Party in the United States with British intelligence and MI6 to invent Russia-gate against Trump. There is the collusion of Obama’s heads of intelligence against the elected President of the United States. When these people criticize China, what you can see is that they are projecting their own intentions and viewpoints onto China and the New Silk Road. These people in the West who are attacking China, cannot imagine the existence of a government which is truly devoted to the common good and a harmonious development of all people, because they think that the world is a zero-sum game—that if one wins, the other has to lose, and that they have to control the rules in order to be able to rig the game in their favor. They believe that if you can’t do that, you are a loser. This all leads to very absurd conclusions. For example, in 1995, Lester Brown, who was the President of the Earth Policy Institute, had a big scare story, “Who Will Feed China?” saying that the growing number of people in China will mean a growing demand for food, which will overstretch demand on the food supply in the world. This is nothing but the old Malthusian idea that the number of people will grow more quickly than the amount of food. Now if you look at China today, they can perfectly well feed 1.4 billion people—and I can assure you, with excellent food. Many countries would be envious to have such good food—like the British, for example. Right now China is producing 30% of the world’s economic growth. So, the reality is quite different from what the Western media portray. In 2014, we published a study called, The New Silk Road Becomes the World Land-Bridge. That is exactly what is happening. What started with just the old Silk Road line between China and Europe, is now very quickly developing into six major land development corridors. Freight trains already run from China to different European locations over 40 rail lines every week. The 16+1 countries—that is, the Eastern and Central European countries and China—are having a conference right now in Budapest. They are completely on-board the collaboration with the New Silk Road. There is a new Balkans Silk Road. The President of Panama was just in China after Panama switched its diplomatic relations from Taiwan; now they are allied with the mainland. The President of Panama said that all of Latin America will join the New Silk Road, and that this is not directed against the United States, because the United States is also invited to join. But the most important shift, of course, is that of the United States, and of the relationship between China and the United States. The result of the recent trip of President Trump and his two-day state visit to China, is obviously the most consequential. Because if the two largest economies of the world have a good relationship, then prospects for world peace are moving in a very positive direction. Remember that the policy of Obama was the so-called “Pivot to Asia” and the Trans-Pacific Partnership (TPP)—which was the idea of the encirclement of China and exclusion of China. There is still an element of geopolitics, so we have to watch whenever the term “Indo-Pacific” is used, which is the idea of making Japan, Australia, and India a counterweight to China. Chinese President Xi Jinping and U.S. President Donald Trump are greeted by a cheering crowd of children during Trump’s “state visit plus” to China on November 8, 2017. But a major breakthrough occurred when Trump visited China, where Xi Jinping gave him the most unbelievable reception—what Xi called ”state visit-plus-plus.” Remarkably, he closed down the Forbidden City for the day. The Forbidden City is the world’s largest complex of palaces, where the Chinese emperors had lived since the 15th Century. It’s incredibly beautiful; it’s majestic, it’s really breathtaking. So, Xi Jinping used an entire day to give Trump and the First Lady a course in Chinese history. They had a beautiful gala dinner; they had three Beijing operas. “Yesterday, we visited the Forbidden City, which stands as a proud symbol of China’s rich culture and majestic spirit. Your nation is a testament to thousands of years of vibrant, living history. “And today, it was a tremendous honor to be greeted by the Chinese delegation right here at the Great Hall of the People. This moment in history presents both our nations with an incredible opportunity to advance peace and prosperity alongside other nations all around the world. In the words of a Chinese proverb, ‘We must carry forward the cause and forge ahead into the future.’ I am confident that we can realize this wonderful vision, a vision that will be so good and, in fact, so great for both China and the United States. The Chinese Ambassador to Washington, Cui Tiankai, recently made the point that there were sixteen times in world history when a rising country surpassed the country that had been dominant up to that point. In twelve cases it led to a war, while in four cases the rising country took over peacefully. He said that China wants neither of those outcomes; instead, China wants to have a completely different system of a win-win relationship of equality and respect for one another. I stuck my neck out in the United States in February of this year, by saying that if President Trump manages to get a good relationship between the United States and China, and the United States and Russia, then he will go down in history as one of the greatest Presidents of the United States. Of course everybody was completely freaked out, because that is not the picture people are supposed to have about Trump. But I think if you look at what is happening, you will see that Trump is well on the way to accomplishing exactly that. Trump came back from this Asia trip with $253 billion worth of deals with China. I watched the Nov. 13 press conference of the Governor of West Virginia, Jim Justice, who said that now, because of China, there is hope in West Virginia. West Virginia is a totally depressed state; it has high unemployment and a drug epidemic. But he said that now we can have value-added production, and we will have a bright future. So the spirit of the New Silk Road has caught on in West Virginia. Obviously, the United States has an enormous demand for infrastructure, especially now, after the destruction wrought by the hurricanes. Just to restore what has been destroyed will require $200 billion, without even talking about disaster prevention. So, this is all on a good path for China to invest in the infrastructure of the United States, and vice versa, for U.S. firms to cooperate in projects of the Belt and Road Initiative. In railways, it has built a railway from Djibouti to Addis Ababa; it is building other railways from Kenya, and they are supposed to go to Rwanda. They are building hydropower dams and industrial parks. Especially in the last four years, the outlook of most Africans has completely changed, because they see, for the first time, that after suppression by colonialism and the denial of development through the IMF conditionalities, there is a possibility to truly develop the continent. They do not want to be lectured any longer about good governance, human rights, and democracy, with no development—which is what the Europeans normally offer, but they want to treated as equal partners. Lyn [larouche] defines economic science as an inseparable facet of science, usefully called “statecraft,” which includes the development of law and the cultural advancement of the people—the development of the individual to master the lawful principles of the composition of the universe. He presented a total counterposition to that of the Club of Rome, with its “appropriate technologies” and its “sustainable development”—which is just another word for no development. He proposed to upgrade the labor force continuously to higher modes of production, by changing the proportions of employment from rural to urban productive occupations, using continuously higher energy-flux densities in the mode of production. He took as a reference point for the development of Africa, the development of the United States, and showed how, for example, in the United States at the end of the 18th Century, 98% of the people worked in agriculture. Today it is less than 4%, obviously producing much more food than at the time. This exemplifies the way for Africa to go, including the development of roads, canals, and railroads; the specialization of farmers; the increase of productivity and income in agriculture and industry; a shift away from labor-intensive to capital-intensive modes of production; and better education—all amounting to the development of the power of the population to produce material alterations of nature with an increasing potential relative population-density and at higher energy-flux densities. Helga and Lyndon LaRouche, September 2017. He said, “The development of Africa must be directed to what nations of Africa are to become by the year 2000 and 2020.” This was written in 1980, namely, two generations ago. He said, “The conception needed is one of the development of the productive powers of the entire population, over the development period spanning two generations.” Apart from basic infrastructure—meaning a continental system of rail, waterways, and highways—he proposed a string of new cities of 250,000 to a maximum of 2 million inhabitants, where at the core of each new city would be an educational complex of pedagogical museums, libraries, cultural centers, parks, and teaching and research institutions, including medical science and research institutions. He proposed a connected system of rapid transport for persons and freight, and low-cost transition from one mode of transport to another. He envisioned inner-city distribution of freight from warehouses in the city to stores, with daily deliveries of perishable goods such as foodstuffs. And around the core of the educational complex, then residential, industrial, and commercial areas would be developed. The cities were not only supposed to be functionally well designed, but beautiful, using the principles of Platonic ratios in architecture. Utilizing, for example, those methods used in Gothic cathedrals, or in the architecture of the Golden Renaissance of Italy. It included the idea of having many trees and flora, so that people would be happy and the climate would be moderated. He said, “The essential thing which the citizens of such a city must experience over the course of the city’s gradual completion, is a sense of ongoing progress of perfection.” To aid this process, there should be technology transfer from the developed countries, financed by grants. He made the correct point that technology transfer from Europe and the United States to Africa would stimulate the economy in the exporting nations and increase their tax income, and that the developing countries receiving grants would become the next generation’s customers for purchasing on a credit basis. The exporting nations would develop prosperous customers for tomorrow, and have an accelerated turnover of capital stocks, and thus those exporting countries would increase their productivity, and therefore their national and per-capita wealth. So what occurs at the point where economic development will have absorbed most of the population of the world? By that time, we must have an increase in the rate of development of technology, such that we no longer depend on the expansion of the economy in scale. When that transition to a new world economic order has been completed, we will have more and more members of society living and working as artists; as “golden souls,” as Plato describes them; as “beautiful souls” as Schiller terms it; as junzi, the Confucian idea of the noble man; or the people living on the level of Paradise in Dante’s Commedia; or, as Vladimir Vernadsky says, that the noösphere—that part of the physical universe which is dominated by creative activity of man—will take over more and more of the biosphere. Actually, what is happening right now goes in this direction. What Xi Jinping has defined as a goal for 2050 for China and the rest of the world, is to lead better and happier lives, with poverty having been eradicated and people being able to devote their lives to meaningful purposes. This actually goes very much in this direction. Is this realistic? I can practically can hear the howls of protest of the neo-liberals and neo-cons alike, in the West. “What about Western values? What about our freedom? What about democracy?”—or better, “market-conformed democracy,” as German Chancellor Mrs. Merkel likes to put it. We had better reflect where these values have gotten us. Europe is completely disunited. We are faced with a financial crisis, worse than that of 2008, about to erupt. The EU has just completed guidelines eliminating the possibility for the separation of the banks, a Glass-Steagall type of separation which China has just reconfirmed. The right-wing movements are rising, and the refugee crisis has caused the reputation of Europe to go down the drain completely in the world. There is a very dangerous anti-immigration sentiment. The entire social and political fabric of Europe is disintegrating. Because Europe, in its present form of the European Union, is like a giant Tower of Babel, attempting an amalgamation of cultures, languages, and histories that leads to ever more frictions between supranational integration and the self-interest of these nations of Europe. This is not the first time that Europe has been in bad shape. This was addressed by Gottfried Wilhelm Leibniz in a policy memorandum of 1670, in which he named the challenges of his time—“in badly established trade and manufacturing; in an entirely debased currency; in the uncertainty of law and the delay of all legal actions; in worthless education … in an increase in atheism, in our morals, which are, as it were, infected by a foreign plague; in the bitter strife of religions; all of which … weaken us, and, … may in the end completely ruin us.” So, that was the situation Leibniz saw. This was still in the aftermath of 150 years of religious war in Europe, when he came up with the idea that the solution was a merger of the Chinese ancient natural theology and European culture. He called it a beautiful coincidence that the two most developed cultures in the world, are like two poles reaching hands across between Europe and China. By creating a common exchange between them, civilization could reach the next, superior stage in human history. In the preface of his Novissima Sinica (The Latest from China), he expressed this intention. Leibniz very closely followed all the news from China. He engaged in a very lively dialogue with many of the Jesuit missionaries, who informed him on all of the developments in science and the famous “Rites Controversy,” in which he sided with people of Matteo Ricci’s view, saying that there was a strong affinity between Confucianism and Christianity. For Leibniz, the affinity of Confucius and Christianity, despite all differences in culture, proved that humanity has the universal characteristic of reason. The fact that the Kangxi Emperor and he—Leibniz—studied the same mathematical solutions, proved for him the universal character of human reason and the human species. In Chinese philosophy, he emphasized that the notion of the li refers to the supreme order of the universe, in which harmony exists if each being exercises its lawful function in its proper place. And together with the notion of ren, which approximates the Christian notion of agapē—love—the Chinese Confucians use different terminologies and different conceptions, but they have analogy with, and affinity to what Leibniz describes in his Monadology. Once one understands this inner cohesion between Chinese ancient philosophy, especially in the Confucian expression, and the idea of Leibniz, it is no surprise that he not only recognized the affinity, but concretely thought a reciprocal exchange of the two cultures would merge into a superior, more advanced level of civilization. Among Leibniz’s plans for this project were the creation of a world language, for which he thought the Chinese language and script were most appropriate; the creation of a world academy of sciences, where Chinese and Western scientists would work together; and the creation of a world citizenship, which would allow every human being to absorb all cultures of the world. He envisioned the future role of Russia in mediating between China and the West, and the development of Siberia in relation to the development of Northern Africa. And Peter the Great, with whom he was in contact, in 1712 ordered the expedition of Vitus Jonassen Bering, for whom the Bering Strait has been named. Further, he advocated the comparative study of languages to find the common origin of human language, which was later pursued by philologists such as Humboldt and others. He proposed a chronology of the history of the West and China—and the only museum where I have seen that, is the museum in Taipei, where you have a beautiful exhibition where you see above the history of China, and below what happened parallel in the Western culture—which gives you a completely different way of thinking about universal history. He also pioneered the binary system, which became the basis for computers and the like, and found evidence of its prior use in China. He proposed the development of a key which would make it easier to learn the Chinese language—now I think everybody who has tried to learn Chinese would be very thankful for such a key. He advocated the development of a method to teach the difference between Western and Chinese culture. He called for defining principles of a new moral code for Western statesmen and politicians, but also to guide the behavior of the ordinary citizen—based on Confucianism. He wanted an analysis of Confucianism based on Western methods, intending to show its closeness to Western Christianity. If you look at these plans by Leibniz, it is absolutely amazing how similar they are to what Xi Jinping is doing with the New Silk Road policy today, which has aspects of all of these plans. We obviously need a completely new set of international relations. We must overcome geopolitics, and we must have a system of relations among us with total respect for sovereignty, non-interference, respect for the different social systems, win-win cooperation in the mutual interest of all of us, and the perspective of one single humanity. Nicholas of Cusa, who developed the method of the Coincidentia oppositorum, the idea of the Coincidence of Opposites, argued that the One has a higher power, a higher order of magnitude than the Many. So the idea of harmony in the macrocosm is only possible when you have the best development of all microcosms. That development must not be static or linear, but it works like a contrapuntal fugue, where each development furthers the development of the next segment, becoming unified into a higher concept of the composition. What we have to build is a completely new set of international relations in which each nation is allowed to celebrate statecraft, meaning making possible the realization of the creative potential of all of its citizens. This will be an interaction among nations in which each focuses on the best cultural tradition and potential of the other. China is reviving Confucianism and its philosophy of philosophical Classical culture in poetry, music, and painting. In Europe, we must absolutely do the same. We must revive the ancient Greek Classical period, which is what Greece is actually doing: They recently had a conference in Athens of the ten oldest civilizations, and they revived exactly that spirit. In Italy, we have the Golden Renaissance; in Spain, the Andalusian renaissance and other great thinkers. In France, you have the traditions of Louis XI, Jeanne d’Arc, and the [ecole] Polytechnique. In Germany, we have a tremendous wealth of philosophers, composers, and poets—Schiller and Beethoven. In America, we have the American Constitution, the American System of economy. All these treasures are there, and only need to be revived. A. China-Mongolia-Russia Corridor — June 2016 the three presidents signed a trilateral economic partnership agreement at the 11th SCO meeting, consisting of 32 proposed projects and finding harmony between Russia’s Trans-Eurasian Belt Development plan, Mongolia’s Prairie Road program, and China’s BRI. B. China-Pakistan Corridor — Highway, railway, oil and natural gas pipelines, and fiber optic projects will equal the value of all foreign investment into Pakistan since 1970, creating 700,000 direct jobs, 10.4 gigawatts of power, and transportation routes that will cut the trade distance between China and Europe, Africa, and the Americas by 2,000 miles. C. New Eurasian Land-Bridge — Goods from central China are reaching Western Europe in 2 to 3 weeks, rather than 5 weeks by ocean. By mid-2016 over 2,000 rail shipments carried $17 billion in goods between China and Europe. Additional developments include the China-Belarus industrial park and a new connection between Central and Southern Europe with the Hungary-Serbia railroad will connect. D. China-Indochina Corridor — Plans for transportation systems to connect ten of the largest cities in the region and additional infrastructure projects, including Cambodia’s Sihanoukville Economic Zone, nine cross-national highways, the Nanning to Hanoi rail line, the China-Laos railway project, the Jakarta-Bandung high-speed rail, and the Singapore-Kunming rail link. E. Bangladesh-China-India-Myanmar — December 2013, the Bangladesh-China-India-Myanmar Economic Corridor Joint Working Group convened its first meeting in Kunming, China. The multi-modal corridor will be the first expressway between India and China. Passing through Bangladesh and Myanmar, the corridor covers 1.65 million km2 and encompasses 440 million people. F. The Maritime Silk Road — Connects China with the Indian Ocean, Southeast Asia, Eastern Africa, Southwest Asia, and Europe, bringing a network of deep sea ports, industrial zones, oil and gas facilities, railway lines and critical projects in Africa. Ethiopia and Djibouti — The new Chinese-built Ethiopia-Djibouti railway marks a milestone in cooperation between China, Ethiopia and Djibouti, employing 25,000 Ethiopians and Djiboutians in the construction of the 470-mile Addis Ababa–Djibouti line, with more being trained to run the rail systems. Kenya — The Standard Gauge Railway will replace Kenya's existing railway (built in 1899 for the purpose of colonial extraction) and transform Kenya's Mombasa port, taking cargo and passengers to the Ugandian border in one-tenth the time it takes by road transport. G. China-Central & West Asia — In June 2015 China and the five Central Asian countries agreed to ‘jointly build the Silk Road Economic Belt,’ and additional routes will go into Afghanistan, Iran, and Turkey. In Uzbekistan, China Railway Tunnel Group has completed the longest tunnel in Central Asia. In Afghanistan a new rail connection with China will shorten three-to-six month cargo transport times to only two weeks. The travel time from Eastern China to Iran will be cut in half. Lyndon and Helga LaRouche have been at the forefront of a global campaign for this new international economic order since their proposal for an International Development Bank (IDB) in the 1970s, and more recently the vision of a New Silk Road beginning in the 1990s. With the fall of the Soviet Union, the LaRouche movement proposed a New Silk Road development corridor, to unite the industrial heartland of Europe to the rapidly developing nations of Asia, bringing Russia and Central Asia into mutual cooperation and development, and thereby creating the conditions to end the threat of global war once and for all. This “peace through development” concept was rejected by the U.S. and its NATO allies, who chose instead to continue treating Russia as an enemy power, moving NATO military forces up to its borders. Russia was looted throughout the 1990s by rapacious western financial interests and by a new Russian oligarchy trained in so-called “free market” ideology by western think tanks and universities. But China gladly embraced the Silk Road concept. A conference in Beijing in 1996, sponsored by the Chinese Ministry of Foreign Trade and Economic Cooperation and titled “International Symposium on Economic Development of the New Euro-Asia Continental Bridge,” featured Mrs. Helga Zepp-LaRouche together with leading Chinese officials. Mrs. Zepp-LaRouche delivered a speech called "Building the Silk Road Land-Bridge: The Basis for the Mutual Security Interests of Asia and Europe." Reflecting an understanding of her historical role in building this initiative, Mrs. Zepp-LaRouche is still known today as the “Silk Road Lady” in China. The process of building this new Eurasian Land-Bridge was slow, in part due to the Asian economic crisis of the late 1990s, but also because China had not yet developed the economic power and financial resources to move rapidly ahead. That had changed by the time Xi Jinping became President in 2013, and he quickly launched the the Belt and Road Initiative (一带一路 / BRI). Lyndon LaRouche’s intelligence service, Executive Intelligence Review (EIR), immediately endorsed and supported the BRI, and began work on a 370-page Special Report titled The New Silk Road Becomes the World Land-Bridge, extending the Silk Road concept to the entire world, including Europe and the U.S., which is suffering a massive infrastructure deficit. This Special Report was followed up by a pamphlet produced by the LaRouche Political Action Committee (LPAC) in December 2015, titled The United States Joins the New Silk Road – A Hamiltonian Vision for an Economic Renaissance. It presented the huge potential for development in the United States: high speed rail (currently non-existent in the U.S.); massive water projects to meet the drought crisis across the Southwest; Hamiltonian credit mechanisms based on FDR’s Glass-Steagall legislation to replace the bankrupt monetarist system; a restoration of the space program which Obama had destroyed; crash development of fusion power; and classical education and classical culture for our citizens. Approximately 20,000 copies of the 32-page pamphlet have circulated in the U.S. over the past year. But now we are in a new era. This pamphlet is more than an updating of that earlier version, both because the demands of the moment are so vast, but also because the potential for an historic victory is so much greater. The precise steps that must be taken for the United States to return to future-oriented growth and join with China and other nations in win-win global development are presented in Lyndon LaRouche’s policy document “The Four New Laws to Save The United States Now.” In this report, each of these four principles is elaborated to provide an in-depth basis according which these actions must be taken. This program will ensure a great and prosperous future for America: productive and meaningful employment for everyone who wants a job, cheap and abundant electricity for all residential and industrial needs with fission and fusion power, the elimination of all droughts and water crises, high speed rail and magnetic levitation transportation between every major city, new world-class cities, a robust interplanetary manned space program, and a new classical cultural renaissance. This isn't asking too much to ask for, this isn't "pie-in-the-sky." This is what is possible, now, if you following the guidelines of this report, and make it happen. Sign up to keep updated on this campaign.